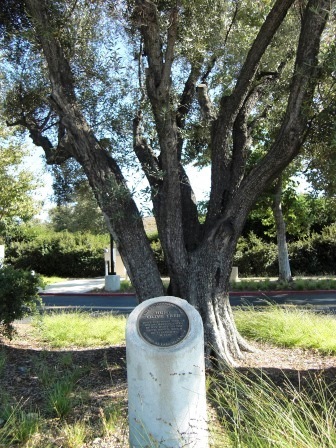 When Richard Orville Hunt and his wife Mary Jane Hunt planted trees in their orchard on the Salto Ranch (currently Lynn Ranch) over 130 years ago, they probably never contemplated that one of their trees would be thriving next to the Circuit City (now Sprouts Farmers Market) parking lot. Well, that's where this beautiful old timer is. I'm not exactly sure why the Hunt Olive Tree was moved here from its prior home in 1993, but she looks like she is doing o.k. This tree near the entrance of the Sprouts parking lot at 600 West Hillcrest was designated a Ventura County Historical Landmark #64 on January 25, 1982. It is also Historical Landmark #4 in the City of Thousand Oaks. Richard Hunt served as postmaster of the Newbury Park Post Office (which at the time was located at his ranch) for 18 years, beginning in 1891. So go pay homage to this lovely link to our local history en route to buying some fresh fruits, veggies and other health foods at Sprouts!